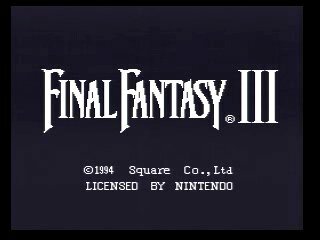 Originally released in Japan in April 1994 as Final Fantasy VI, it came to the US in October as Final Fantasy III. The game follows the adventures of a rebel group named The Returners. They attempt to stop an evil empire eager to steal magic for its own desires, which could plunge the world into a second War of the Magi, an event that devastated the planet a thousand years ago. Will history repeat itself? Best time: Single-segment 4:50:31 by 'LCC' on 2014-04-19. Essentia and the SDA community for providing the route that this run was originally based on. I wasn't around during the early stages of FF6 speedrunning so I don't know the specifics of who contributed what, but I do know that Essentia had put in the most work out of anyone when she was actively running the English version of the game. I have changed many things in my route compared to her's, but I wouldn't be where I am today without her work. Wypy for making me aware of how the Veldt works. Dessyreqt and Kilaye for making me more aware of memory values that affect encounters and some RNG patterns (river battles, NPC movement, etc). Puwexil for generating ideas and helping with the money route. Myself086 and Zhexx for creating Slots calculator programs. Terii Senshi for creating an algorithms FAQ which has a lot of useful information. Anyone who has ever run FF6, no matter how good you are. Even watching the worst FF6 runs can spark ideas. The Japanese runners in particular inspired a couple of boss strategies. Throughout the run character's names are shortened to a single letter to reduce how much time the game takes to draw the text every time the name is mentioned in cutscenes. ATB - "Active Time Battle", when people refer to ATB they are talking about the gauges that fill on each character to trigger their turn. For example, "Good ATB" refers to when a party member starts a battle off with their guage nearly full. In battles you can pause ATB by opening a menu or selecting a special skill like steal without confirming it. This is referred to as the "Wait Trick" and is heavily used through the run to reduce how many turns enemies get, primarily bosses. The most common use is to open a menu while one of your characters is performing an action with a long animation so that the boss doesn't fill their ATB gauge during it. If overused it can work against you since it also stops your own characters' ATB gauges. There are certain tiles on the World of Balance world map that do not have encounters. Throughout the run there will be some walking that looks odd, but it is to hit those tiles efficiently. There is a value stored in the cart's battery memory that affects encounters. Prior to the run resets are done to manipulate this value to set up encounters a certain way. This does not mean that the encounters will be exactly the same every time, mainly because of recruiting Gau not being guaranteed on the first encounter, the extra 2 river battles in Terra's scenario, and the flames in Thamasa. Making mistakes with walking is also a factor. The less enemies there are on screen, the easier it is to run away. Preemptives allow you to run immediately. Slots are rigged in this game by manipulating a value that is changed by animations that occur on the battle screen. The echo screen's smoke animation sets it up perfectly, which is why you will often see one being used before performing slots. This is what allows 7-7-7 instant kills to be used, otherwise they are impossible to get. Many bosses and enemies have predictable AI scripts where they will do certain things on certain turns. Battle type is left on Wait, Message Speed is set to highest, and cursor is set to memory. Battle speed is left at 3 for now to set up a quick kill on Whelk. Battle speed only affects the speed of the enemy's turns, while yours remain the same. Having Vicks/Wedge run from battles gives more exp to Terra, since it is split amongst the active party members at the end of each battle. Since Vicks/Wedge leave forever after the esper encounter, they do not need any. There is a tile that is walked around to skip two battles. Whelk fight - Battle Speed 3 is used to prevent Whelk from entering the shell before you get the 3rd Tek Missile off with Terra. The strategy relies on Terra's starting ATB being decently high. There is a battle timer that triggers the sequence where Whelk goes into its shell. This trigger only happens after the timer has reached a certain value AND whelk gets a turn. Battle speed 3 and using wait tricks triggers Whelk's 2nd turn before the battle timer has triggered the "Go into shell" sequence, while still keeping Whelk's turn order behind Terra's, which is what allows Terra to get the 3rd tek missile off. Terra is leveled to LVL 6 so that Locke and Edgar join at higher levels. Enemies are skipped during the moogle sequence by passing by them during their step animation. Mog's equipment is removed to use/sell, as it is good equipment for this period in the game. Edgar acts first vs the m-tek armor so that his crossbow doesn't get delayed by a steal animation. There is a bit of grinding done throughout South Figaro Cave through to Vargas, but it only requires the battles you normally get anyway. x2 hornets and x2 Brawlers give low exp, so I tend to run from those unless Edgar gets good ATB. Locke runs away from one high exp battle since he requires less to reach his target level compared to Terra. The atlas armlet is picked up to be able to 1 shot enemies with autocrossbow and is useful for extra damage throughout the run. Vargas fight: Locke starts in the back row and uses the row command in battle to prevent being killed if both bears attack him at the start. His damage will not help to kill the bears faster. A Save & Reset is done to manipulate the river battles and encounters. Saying no to Banon skips a cutscene and nets a Genji Glove. I left Banon/Sabin in the front row because I know I'm only going to get 2 battles. Normally you would back row them if you're not manipulating the river. x2 Pterodons are fought with Edgar alone to give him 1 level and additional money. This level helps increase damage vs bosses and to 1 shot rats at the opera. Terra does not cast fire on Ultros because it triggers a counter and dialogue. Banon will never be targetted aside from the opening attack, so there is no need to heal him. Scenarios are done in this order: Sabin, Locke, Terra. Sabin is first because you get smoke bombs, Locke 2nd to get runningshoes to equip on edgar. Shadow is recruited here to grab his Ninja Gear. It adds speed to the wearer, which helps save small amounts of time throughout the rest of the run. Shadow makes the run safer and guarantees fast Templar/Soldier fights in the base. It is still preferred to get the black belt drop to sell, though not mandatory. Overall, recruiting him makes Sabin's Scenario slightly slower on average, but you gain it back and more later because of the ninja gear. I made a mistake on the last battle with the Cadet/Soldiers. Normally you want to wait with Sabin to see what Cyan does before attacking. I do not walk around the ghosts to avoid taking extra steps. There is an encounter against 4 whispers that would occur outside the tram if even 1 extra step was taken. I do have a new step route that gets 1 less encounter AND allows you to walk around ghosts, but I didn't discover it until a couple months after this run. The train is undead, so you can 1 shot it with a fenix down or an elixir. Suplexing is mandatory! Items are arranged while waiting after the cutscene. It is on a timer that counts down even while in the menu, but you have to exit the menu before it will end, so you have to be quick. This battle is on a timer; you have to wait about 8 seconds after the music loops before the boss will appear, so that is what I do. I mistakenly sold the Air Lancet, which is normally used in Locke's scenario to kill yourself faster, but it's not a big deal. I had to fight two extra battles to get Gau. This is one of the biggest time losses in the run. The paths taken are the fastest, avoiding the long cave as well as extra battles. Echo screens are purchased here to avoid a 2nd shopping trip later on, though they aren't used until much later (for rigging slots). In some cases you have to delay it if the money situation is bad. A fade-in glitch is used to clip through the soldier blocking your path on the right side. After that the scenario is essentially done "backwards"
By naming Celes it puts her character into memory, that would otherwise be occupied the moogle Kutan. This is very important since Kutan is worthless and cannot be equipped with anything. After this I kill myself by encountering a magitek soldier to warp back to the beginning. This avoids the cutscene of saving Celes and having to walk back through the basement with encounters. Banon is moved to the front row here as he shares a character slot with Leo. Leo will later need to fight Kefka while in the front row, so it saves menuing later. The party used is put into the 2nd slot as it guarantees no soldier will touch either of the other parties. All of the highest damage characters are used for the fight. Wait tricks are used to prevent Kefka's third turn, which is the only one where he can cast Ice 2 (can potentially wipe you). The shack pickups here are primarily for selling. Edgar is put into the lead position because he gets discounts at the castle. Party choice is mainly high damage dealers and Locke for speed to run away with smoke bombs faster. Revivifys are for grinding on undead monsters later. The Dadaluma strategy revolves around getting 3 turns in with Locke/Sabin/Edgar before dadaluma's first turn. After reaching a certain hp threshold he will heal himself, so getting in early damage will gives enough time to kill before he gets a 2nd turn. If you get bad luck (dadaluma acts first) you have to wait until after his 2nd turn before doing the rest of the damage to kill. Putting Locke in the front row gives just enough extra damage to save a turn and prevent him from healing. Locke equips siren soley to learn sleep for an upcoming boss fight and Sabin will be maxing out stray by the end of the game, as float is needed for the final boss. The white dress is bought to buff magic power on celes and terra later. Talking to the impressario from behind, then the letter from the bottom saves time since your character normally auto walks to that position slower if you talk from the other side. Ideally you would get 3 rat fights here then use one of the random battles at the factory to learn sleep, but rats are nearly impossible to dodge without getting lucky. Just about everything from this point on is picked up for selling, though the thunder blade here does buff Edgar's damage a bit for No 024. There is a bug that lets you run away from Ifrit during the transtion to Shiva. After attacking 5 times, Ifrit wil switch to Shiva on his next turn. Wait tricks are used to manipulate Ifrit's ATB so that he does not get his 2nd turn until all 5 attacks have connected. When it transitions the "can't run away" flag is removed and the battle effectively becomes like running away from a preemptive. In some cases the party will not run. I have a theory as to why this happens sometimes but I am not 100% certain yet. After getting the espers I move Sabin to the lead position. This is to manipulate the mine cart battles, which are affected by various things, one being who the character in the lead position is before entering the esper room, and before hopping on the minecart. I maximise speed and GP gained from the battles. I employ a strategy that uses Shoat for No 128. It has about a 2/3 chance of killing BOTH arms, which did happen in this run. If it kills neither arm then a lot of time is lost and the battle gets dangerous, but I've only seen that happen in a run once so far. Killing only 1 arm makes it about as fast as the more popular strat of using phantom and physically attacking the main boss without killing arms. The first Jokerdoom of the run is used on the cranes. Using an echo screen sets up the slots to be able to use 7-7-7, otherwise it is impossible to get. The first reel is locked in manually using pause buffering, then the next two are very loose on their timing since they will home in on the 7s. Terra grinds up to lvl 20 here. This is the "magic" level for doing enough damage to bosses and at the IAF/Floating Continent. Maduin is equipped for both learning bolt 2 and the magic power bonus on level up. Generally you get exactly the number of battles needed to reach this level, so it works out nicely. Walking in/out of the main building despawns the red guy you normally get stuck behind, saving a small amount of time. In some rare cases there is a run ending glitch that ejects a party member out of bounds when the party is split to talk to Gestahl. In every recorded instance of this ocurring Edgar has been the party leader, so I put Setzer as leader due to paranoia. Only 23 soldiers are required to get the charm bangle. Every screen transition the timer gets paused briefly, losing a small amount of time, so talking to the 24th soldier goes against you. At the end there is time to spare so I change the window colour, which does nothing to affect gameplay other than making the window look pretty. The only place in vector that allows you to use a warp stone in the cafe, so I walk there first before menuing. The runningshoes are used over the back guard in this route since Locke stills gets turns very quickly, even when back attacked, and you will never be in danger of dying from them. Big selling section. Rods are purchased to kill bosses and fend off ninjas. They are overpowered since they ignore defense. Had decent luck dodging fire. I tend to brute force it since it is very difficult to actually dodge them consistently, and you'll usually end up losing more time trying to dodge compared to just running through. Since the turn order starts from bottom to top, I put Strago at the bottom position to ensure a fast kill on Ultros. His ATB fills the slowest, which is why I need him to go first. This skips haste/safe and dialogue from Ultros. This is where putting Banon into the front row pays off for Leo. He will start in the front row, which saves me from having to menu before fighting Kefka. It is not possible to open the menu before the first fight, which is why it is done after it. This section didn't go particularly well with damage rolls on ramuh (can 1 shot red guys) and with absolute zero requiring me to heal after most battles. The ultros battle disables the ability to use the normal 7-7-7 jokerdoom, so it is required to use slots differently. By using muddle and then hitting Setzer out of it after inputting the 7-7-BAR slots it reverses the targetting of the jokerdoom that is normally supposed to target your own party. This is commonly known as a Reverse Jokerdoom. Phantom is used to guarantee the muddle will hit Setzer 100% of the time, but isn't necessary to perform the trick. It can be difficult due to time constraints and having to confirm all 3 reels manually. Luckily I timed it very well in this run. The next boss can be jokerdoomed, but the thunder rod is much faster. After stepping on the switch to lower the land it actually takes less steps to go back the way you came, but the animation time of the teleporters makes it slower. Time is lost on nerappa due to not being able to get the Thunder Rod off before the boss acts (luck based). A save and reset is done to manipulate fish movement patterns as well as encounters. A major mistake was made on movement during the fish section, costing about 45 seconds. Normally with manipulation you can save Cid in 4 cycles, but it requires near perfect movement. Making 1 mistake will throw off what fish spawn as well as their movement patterns. This is the second big selling section. An enhancer is bought to buff magic power and magic block. Bard's Hats and White Capes are for magic block. Since magic block allows you to evade both physical *and* magic attacks, it is very important. Evade is a bugged stat that does nothing. The last digit of the GP total affects an upcoming boss's attack (lvl ? pearl), so it is set to a number that will not match up with a multiple of any of the party's levels. The thief to the left is talked to first to avoid being blocked by him on the way out. Runningshoes are used to prevent stop from being inflicted on the party from tentacles. This guarantees they will never be picked up by a tentacle because they are required to be stopped first. I travel to Narshe first before grinding to set up the battles in Maranda desert to give me a cactrot. The cactrots both provide enough money to purchase a Tao Robe as well as Magic Points to learn spells. Mog and Gogo are recruited to make Kefka's tower surviveable and to be able to kill bosses with slots. The thunder shield is picked up as a safety for the final boss. The party setups are done out of necessity. All the bosses are pretty boring instakills, but it's the fastest way of course. There are inescapable battles that be be dealt with by using jokerdoom or vanish+doom, but they are reduced in this encounter route. I knew beforehand that I would never get the Outsiders encounter, which can wipe your party easily. The middle party has mog and setzer since they only encounter one boss that starts as a preemptive and they pick up mandatory mblock boosting equipment. The right side party needs Gogo to be able to jokerdoom bosses (some cannot be vanished, so no vanish-doom), and he has higher mblock compared to setzer. The left party is best suited to one that knows vanish to avoid dying from outsiders as they walk through the longest room where you can encounter them. It was not used in this run because i knew i wouldn't encounter outsiders in advance. Celes has high natural magic block and can make use of force armor as well, which makes her well suited to fight Doom. A couple mistakes are made, missteps that result in getting into one extra inescapable encounter, and a menu flub in one of the battles. I probably should have forced an extra battle before the room with doom dragons, as they are somewhat dangerous. This uses a strategy that is very similar to FF5, where you max out the mblock of one character and have them guard all other characters that are in critical status. White capes are actually used for their original intended purpose on Sabin & Setzer: to protect against imp. This fight uses a modified version of the Reverse Joker Doom that was used earlier in the run, but it uses the remedy spell instead of attacking the muddled character that used slots. Tier 1 - I cast break on the left side arm to prevent it from using its final attack that is unblockable. Because Gogo gained a lvl in the tower he survives the thunder rod, speeding this up a bit. If the head is the last to die it uses quake, which is where float comes in. The thunder shield is equipped on sabin to increase his chances of surviving opening attacks from tier 2. Tier 2 - This went perfectly. If nobody dies you can immediately do a reverse jokerdoom, which is what I did. I swapped the thunder shield from sabin to gogo to guarantee his survival against merton on tier 3. Tier 3 - This has a 1/3 chance to use merton, and it did. It is very bad because it is luck based on whether gogo will block calmness, which is an instant death attack. Celes's force shield is swapped to gogo to increase his mblock, and it ends up working out. Gogo having runningshoes is required to be able to pull off the 3 mimics, since without it the back part of tier 3 "Lady" will always be able to cast Life2 before you get a 2nd turn, thus putting you into an infinite loop and makes it impossible to win. The mimic is trying to target things that don't exist, which fixes itself on the 2nd mimic that you use. If I had doomed the top part of tier 2 the first mimic would not have used jokerdoom on the front part and would have acted liked the 2nd mimic did in this run, though overall is slower to do so. Kefka - Mimic twice and win. You can skip fallen one if you equip ninja gear on gogo to buff his speed, but the sacrificed mblock makes it too risky on tier2&3.